I’ve really been enjoying the “Blackened” flavor of the past few days. The accidentally smoked beef post yesterday had my mouth watering all day – and I could not wait to give it a try with a different kind of meat! This time, however, it was entirely intentional! Slice up the onions and caramelize them in the pan with the coconut oil. This is an important first step, and cannot be combined with cooking the shrimp. Also, these are not going to be used, so have a container handy to take most of them out afterward. Because of how you’ll cook these, I suggest having some tasty vinegar and some quality olive oil to store them with for your next use. Overcook the caramelized onions significantly. These should be crispy, and should be leaving that “burnt” residue behind on the pan. We’re using onions for this job for a couple of reasons: first, they have quite a satisfactory “burnt” flavor. Second, they do this job very well – perhaps the best of any food I’ve used. So if you’re looking to produce a “burnt” flavor and coloring, onions are just the tool for the job! Be careful, though. You want these to be significantly overcooked, and to leave a residue behind. But you do not want to completely ruin them and have to throw them away – we don’t like wasting food, after all! Once the onions are well overdone and removed from the pan, add the shrimp and cook on high. I like to start these out covered, because it makes it easiest in the long run to heat them up and thaw them all out. But as soon as they’re at a rolling boil, I take the cover off to let the liquid boil off, leaving just the shrimp and flavor behind! Be sure to stir regularly and thoroughly as the liquid is boiled off, to ensure that the flavor has even distribution on the shrimp. 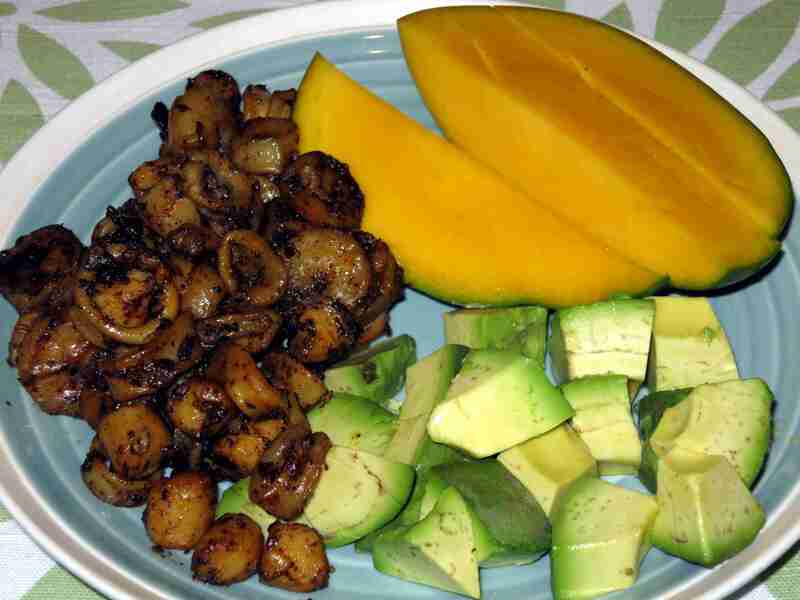 While the shrimp is cooking, slice up the mango and avocado. Mango and avocado are the perfect accompaniment for this meal! The shrimp have a very rich, heavy flavor. So accompanying them with just the right sides is important – if you use something too rich, it could make the dish overpowering. But if you use a salad, it may not support the “blackened” flavor enough. As soon as the shrimp is done, serve the dish. These are great piping hot! Like most seafood dishes, they’re not that good if you let them cool too much, so the sooner you get to eating, the better they’ll taste! If you’ve got questions, suggestions, or any other reason to write in, please post in the comments! Lucas, this sounds great! I do eat some fish, so I’ll give this a try. Thanks! I’m so glad you like it Sherri! Dude you have been cooking up some awesomeness.